A day after senior BJP leader Subramanian Swamy's remark on Gautam Adani's alleged PSU bank debt, shares of Adani Group companies tumbled over seven per cent on the domestic bourses on Wednesday, wiping-off Rs 9,761.3 crore in market capitalisation (m-cap). BJP MP Swamy on Tuesday dropped a bombshell on industrialist Gautam Adani, calling him the "biggest NPA trapeze artiste in PSUs". During Wednesday's trade session, Adani Enterprises' stocks plunged by 7.24 per cent to Rs 172.40, while those of Adani Ports (and special economic zone) slipped by 6.53 per cent to Rs 377.45 per share. In addition, scrips of Adani Power and Adani Transmission declined by 6.60 per cent and 7.67 per cent, respectively. "Adani group stocks extended its fall after BJP MP Subramanian Swamy on Tuesday called industrialist Gautam Adani the "biggest NPA (non-performing asset) trapeze artiste in PSUs," said Dhruv Desai, Director and Chief Operating Officer of Tradebulls. 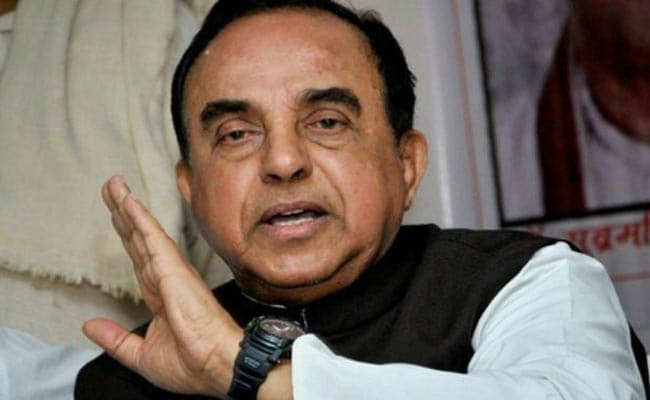 In a widely commented and shared tweet, Swamy on Tuesday said Adani -- believed to be close to Prime Minister Narendra Modi -- should be made accountable or he (Swamy) would file a Public Interest Litigation (PIL) in the court for recovery of bank loans from him. However, the same day, the Adani group clarified that it had diligently and regularly serviced all its debt, saying: "The singular critical test for debt is its regular servicing -- something which the Adani Group has implemented diligently, since its inception." In a statement, the company clarified that the group's dependence on public sector banks for long-term borrowings was less than 50 per cent at about Rs 34,000 crore, and it was regularly serviced.